Tyler Boggs earned his first ever Oakshade Raceway UMP Late Model Feature win on Leupp Outdoor Equipment Night as he edged out a hard-charging Jon Henry at the finish line. Boggs started on the outside of the front row and took command at the onset and set sail. A close call on lap 16 almost took him out of contention as some cars at the back of the field wrecked just in front of him. Boggs somehow navigated through the melee, but third place driver Rich Neiser didn’t make it through and had to restart at the back, ending his top five run. Jon Henry battled with Rusty Schlenk for second and eventually took the spot. Henry managed to close in on Boggs and somehow got to the inside of him as the two drivers exited turn four with the checkered flag in sight. Tyler Boggs from Warsaw, Indiana held him off on the outside and took the victory by just inches over Henry who was also looking for his first Oakshade UMP Late Model Feature win. Schlenk held on to finish second followed by Casey Noonan and Brian Ruhlman. Kevin Reeve started 18th and passed more than half the field to finish sixth. Jon Henry picked up an extra $250 for winning a special Australian Pursuit race sponsored by Leupp Outdoor Equipment a little later in the night over Rusty Schlenk and Ronnie Perrine Jr.
A couple young drivers put on a show in the UMP Sportsman Feature event. Point leader Matt Lindsey took the lead at the drop of the green flag. Sportsman rookie Brett Miller, who already has a feature win this year, pressured Lindsey for the lead much of the race with veteran driver Bruce Stuart also joining the battle at times. In the end, Lindsey held off Miller in a close finish to win his third feature of the year and added to his point lead in the UMP Sportsman division at Oakshade. Mike Jessen got by Bruce Stuart to finish third and Joe Smith moved up to finish fifth after starting 14th. Craig Dippman has not had the kind of year he would like so far, but things may be turning around for the Northwood, Ohio driver. Dippman took the lead of the UMP Bomber A Main on lap three from Dan Plath and didn’t look back. Rick Dixon got crossed up in the first half of the race and collected point leader Jim Scout, forcing both drivers to the tail of the field. Dippman was unchallenged most of the event, but Danny Hogrefe closed in and made a race out of it just before the checkered flag, but Dippman fended off the challenge and took his first feature win of the year. Hogrefe settled for second followed by Kyle Light, Dan Plath and Dan Shaffer. Fifteen year old Dylan Herman from Custar, Ohio earned his fourth UMP Hornet Feature win of the year. Adam Noonan closed in for a challenge for the lead at one point, but slipped up high in the corner and fell back. Derek Morris took advantage of Noonan’s slip to finish second with Noonan ending up third. Drew Smith and Max Essman rounded out the rest of the top five finishers in the caution-free event. Dustin Sautter exploded out to a big lead at the start of the UMP Bomber B Main. Dan Dippman was the man on the move, taking third place by lap four after starting dead last. Dippman suffered some bad luck on lap seven when he spun while battling with Jake Gamber for second, forcing him to the tail again. Sautter went on to pick of the victory over Jake Gamber, Curt Lancaster, Tony Tolles and Justin Gamber. Dan Dippman fought back to finish sixth. Jim Guinn started on the pole of the UMP Bomber C Main and opened up a huge lead over the rest of the field and appeared to be on his way to an easy victory. Guinn suddenly slowed on the track with two laps to go allowing Jack Garland to get by for the lead. Garland went on to pick up the victory. Guinn got his car back up to speed and finished second followed by Jesse Moyer, Skyler Plotts and Jim Plotts. 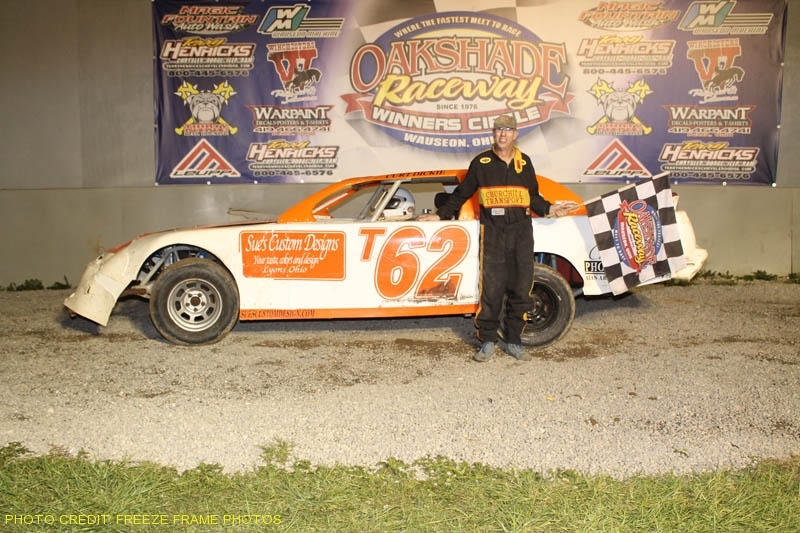 Oakshade Raceway will celebrate the Fourth of July this Saturday with a full racing program of UMP Late Models, UMP Sportsmen, UMP Bombers and UMP Hornets in addition to a fireworks display. Gates will open at 4pm with racing at 7pm. Matt Miller’s worst finish in an UMP Late Model Feature at Oakshade Raceway this year is one second place finish. The other three have all been wins. The latest of which came in Saturday night’s Butch Wildermuth Memorial/American Late Model Series (ALMS) Feature. The third place point man in the ALMS standings, Ky Harper, suffered some bad luck on the very first lap of the feature after getting turned around on the backstretch and collecting a couple other cars to bring out a caution flag. The right side of Harper’s borrowed ride was peeled off and he ended up retiring to the pits. Rick Delong got the early lead over Rich Neiser and Matt Miller. Those driver went three-wide for the lead on lap three and one lap later Neiser fell off the pace and rolled to a stop to bring out another caution which ended Neiser’s evening. Matt Miller took the lead from Delong one lap after the restart and once again began to drive away from the rest of the field. Another driver in the top five of ALMS points, Shawn Negangard, suffered a cut tire and went to the pits for service, but could not get the tire changed before racing resumed. Hillard Miller won an exciting heat race earlier in the night and had a very strong top five run going in the feature, but pulled out of competition with mechanical issues late in the race. Miller went on to impressively earn his second consecutive feature win with Rusty Schlenk and Tyler Boggs finishing second and third respectively. Rick Delong slipped back to finish fourth with ALMS point leader John Henry coming home fifth. Joe Smith started on the pole of the UMP Sportsman Butch Wildermuth Memorial Feature looking for his third straight feature win, but Matt Lindsey had other plans and took the early lead after starting on the outside of the front row and never looked back. A spin on lap four forced Joe Smith to restart at the tail of the field which pretty much ended his hopes of the three-peat. Brett Miller began to pressure Lindsey for the lead after a lap eight caution for Gary Nopolis’ spin. Miller appeared to be a little bit better just after the restarts with Lindsey looking stronger after a few green flag laps were run. Lindsey held off the challenge, but one more caution late in the race would give Miller one last shot with just two laps to go. Lindsey held on to win his second UMP Sportsman Feature win of the year with Miller settling for second. Mike Jessen, Joe Derbeck and Amy Bernard were the rest of the top five finishers. Jerry Signor, Ron Tolles and Jim Scout battled for the lead at the start of the UMP Bomber Butch Wildermuth Memorial A Main with Scout taking over on lap four. Scout proceeded to pull away from the rest of the field, but Signor reeled the leader back in late in the race. In the final set of corners Signor dove to the inside to challenge for the lead, but Scout held him off in an exciting finish picking up his second feature win of the year. Danny Hogrefe and Craig Dippman started deeper in the field and ended up third and fourth with Ron Tolles slipping back to finish fifth. Dylan Herman led the entire distance of the UMP Hornet Feature event to win his third of the year. Adam Noonan recovered after a slight tangle with Dylan Burt on the first lap to take second with Hornet point leader Drew Smith finishing third. Tyler Line finished fourth and Dylan Burt slipped back to finish fifth. Dan Dippman started on the pole of the UMP Bomber B Main and never looked back after the green flag dropped. Chris Williams was running in the top five, but a spin on lap 5 sent him to the rear. Fred Burtch put some pressure on Dippman for the lead at one point in the race, but slipped up high in the corner and fell back through the field. Dippman went on to the victory followed by Josh Overmyer, Jody Burton, Tim Mullendore and Jeff Gies. Karl Spoores led the first two laps of the final event of the night, the UMP Bomber C Main, but then slowly dropped off the pace and began to fade. Dan Shaffer took the race lead and went on to the win over Kyle Light, Ron Leonard, Brian MacKenzie and Nathan Goodman. Another full racing program highlights Leupp Outdoor Equipment Night on Saturday, June 27 at Oakshade Raceway with UMP Late Models, UMP Sportsmen, UMP Bombers and UMP Hornets all in action. Gates open at 4pm and races start at 7pm.